One of my favorite mottos is “everyone can have better skin.” From acne to brown spots, and wrinkles to redness, issues will crop up and treatments vary and improve over time. People often ask me when should they start seeing a dermatologist. The truth is almost any time is the right time. It’s never too early or too late to take care of your body’s largest organ, the same as you do the rest of you. Thirty years ago, doctors noticed patients who were treated for adult acne and used Tretinoin (aka Retin A) and sunscreen religiously, maintained their youth and were considerably younger-looking than their peers. In your 20s and 30s, the most important thing you can do is to use sunscreen daily, and reapply frequently. Once you’re in that habit, add in cosmeceutical products using our GRASSE mnemonic, to address your particular skincare concern, and slow the aging process. Aim to keep your skin tone even by removing broken capillaries and brown spots as they arise. The use of gentle lasers like Clear + Brilliant or micro- needling can repair early damage and add collagen and elastin back as it is being lost. AM I TOO YOUNG FOR INJECTABLES? Prevention is so much easier than repair! Just take a look at one of our employees on the next page. The photos on the left were taken when she was 32, the photos on the right at 42. Talk about staying the age you start! Use all your GRASSE products on your neck and hands, as well as your face. In this age range we notice lost volume due to natural lessening of the fat pads in the face which leads to a tired, saggy appearance. This is de nitely the time to replace volume with llers. Bringing pictures of how you looked in your 30s to Dr. Welsh or Dr. Hui can be helpful in developing your treatment plan. Your neck also deserves attention in this age group. We recommend using neurotoxins to relax the neck bands, or skin tightening procedures such as Fraxel Dual, CO2 laser, Ultherapy, or Silhouette Thread lifts. We have a great deal of control over how we age. Sun damage is the primary factor, but diet, weight, and smoking also contribute. You only need to compare the back of your hand to a sun protected area of your skin (like your chest or behind) to see how much the sun contributes to your individual skin aging. Identical twin studies dramatically illustrate this. Don’t despair. Even if you were unaware or just didn’t care when you were young, you can still reverse the aging process. I’m 58, and I promise you, it’s possible. I call this the “Benjamin Button Effect,” referring to the novel and movie where the main character aged backwards. It’s not just ction! 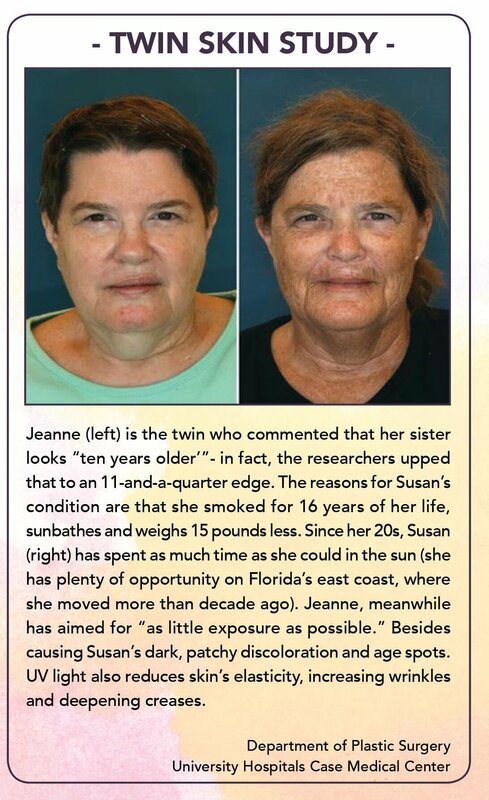 Take an extreme case of these identical twins, Jeanne and Susan. 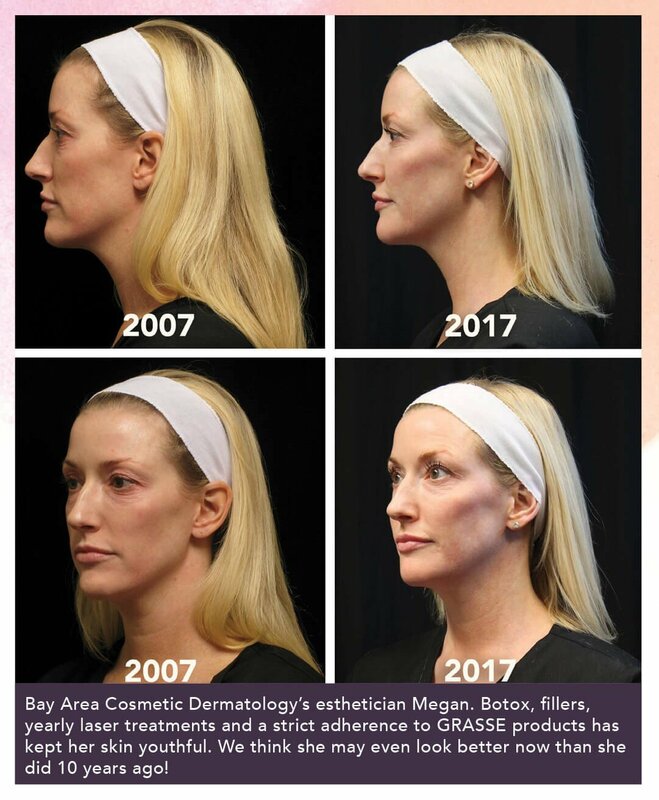 If Susan, the twin on the right, decided at age 61 that she wanted to correct her skin we would rst suggest she use aggressive skin care program aimed at reversing pigmentation such as the Obagi system with Tretinoin (Retin A). After 6-8 weeks on the program, she could be a candidate for Fraxel re:Pair resurfacing of her face and neck. Coolscupting or Kybella could reduce the fat under her chin. Ultherapy or radiofrequency treatments, along with ller, could rm the skin and smooth the lines. Finally, Botox or Dysport could soften her expression lines in the forehead and at the crow’s feet. A few threads of Silhouette Instalift could also be placed to improve any remaining facial sagging. In a short amount of time, the sisters could again look like twins! Whatever age you are, and whatever the condition of your skin today, I know we can help you improve it. Remember, anyone can have better skin!